The chairman of the committee drawing up a groundwater basin management plan Tuesday opposed a request before the Nye County Commission to impose bylaws, even though members of his committee voted 5-1 against enacting bylaws on themselves. Greg Hafen II said the committee decided if any actions came up that would normally be addressed by bylaws they would make a decision at that time. He said he wasn’t aware of other advisory committees with bylaws. “Do you want a specific form for this committee to follow or do you want results? If the committee cannot get results, the state engineer has said that he will come in here and he will tell us what to do and that is not what we are here for. These bylaws as written are overly burdensome and do not address the true issues at hand,” Hafen said. For example, Hafen said limiting the committee to discussing water rights says nothing about domestic wells. Bylaws describing concrete numbers don’t take into account wet years and dry years, he said. Then there’s an article mandating training on Nevada Revised Statutes, Nevada Administrative Code and Nye County Code. Hafen also objected to guidelines mandating two meetings per month, unless the committee decides otherwise and that the meetings be held at 7 p.m. He said the county wanted to mandate who can make motions and seconds, restrict staff on presenting items and dictate the order board members can speak based on seating arrangements. “You want to handcuff us and then you’re asking us to sign off on it and you can’t even get our names spelled correctly. We will spend more time dealing with bylaw technicalities than actually getting results. Is that what you want?” Hafen asked. But committee member and county commission candidate Dave Caudle thought bylaws were necessary. “Without bylaws we’re just a bunch of people meeting, batting things around a little bit,” he said. Caudle wanted items that weren’t included in the suggested bylaws concerning conflicts of interest. The board was deliberately set up to include members of each of the private water utilities in Pahrump, along with a representative of well owners, developers and the general public. “This is the most important subcommittee of this board that has ever been in this valley. If the water board or committee doesn’t come up with a good, proper plan, then we’ve wasted a lot of effort, No. 1, but No. 2, the state engineer is going to come in and do whatever he wants. So we needed some kind of structure and that’s what these did,” Caudle said. Committee member Wendy Barnett, president of Utilities Inc. of Central Nevada, said she could’ve been restricted from speaking to area Realtors recently under the bylaws, as she wears many hats. She said the advisory board has held very civil meetings and got a lot accomplished so far. She said Hafen is doing a good job running the meetings by Roberts Rules of Order. Committee member Kristian Bentzen wanted a way to get alternates seated on the regular board. They include Kenny Bent, Mike Floyd and Judith Holmgren. 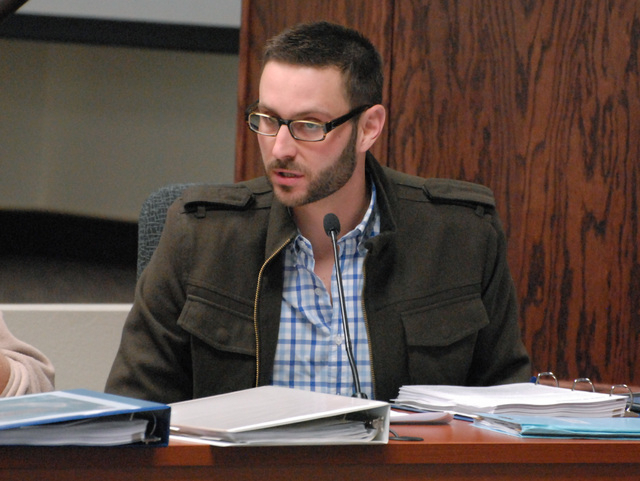 Bentzen was in favor of bylaws. Commissioner Frank Carbone, who sponsored the item, said he wanted some sort of footprint for the committee to work with. “We want to make sure we have some structure and get things accomplished,” he said. Tim Hafen, the grandfather of Greg Hafen II, said bylaws just create more arguments and nothing gets accomplished. “This morning we heard you need to get government off our backs. Don’t interfere with us. Now some of the same comments are coming back they want bylaws, so that they got rules. I don’t see the consistency of that,” Tim Hafen said. Water board member John Bosta said a set of bylaws is needed. He charged the chairman was running the meeting the way he wants. Commissioners ended up not voting on the bylaws. Schinhofen felt if the committee voted against bylaws, the commission should respect its wishes. “This is turning into the type of committee that I warned about when we set this committee up; we would be so concerned about the form and look of it we wouldn’t get anything done. I am not in favor of imposing rules on them,” Schinhofen said. He said when the committee was set up it was hoped it wouldn’t take more than six months to a year to draft a plan. Commissioner Lorinda Wichman said normally an advisory board proposes rules for the county commission to adopt. “This is almost like trying to establish some sort of form over content and I am much more in favor of content and I don’t want to limit the imagination of this group,” she said. Carbone said the bylaws were written by several individuals, that included people in the audience.